This week (Aug. 2-8) is National Farmers Market Week, by official proclamation of the U.S. Department of Agriculture (USDA). There are so many reasons to go out with your shopping bags and celebrate the rapid rise in the number of farmers markets across the nation. One of them may surprise you. 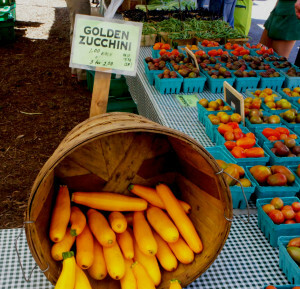 You can get a whole lot of beautiful food at farmers markets for not a lot of money. 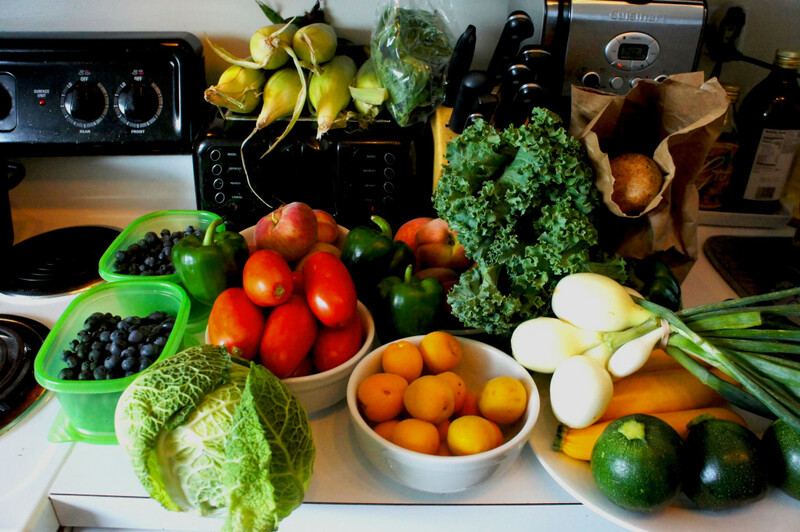 This was the author’s haul from Chicago’s Green City Market on Aug. 1. First, the non-surprises. The quality, freshness, nutritional value — and taste — of the products for sales at farmers markets are as good as it gets. Most farmers markets source products from local and regional producers (a radius of roughly 300 miles has become a standard in our home area of Chicago, and most are much closer). And as more and more consumers make a priority of identifying where their food comes from and how it was produced, farmers markets are the embodiment of the “Know Your Farmer, Know Your Food” mantra. There is plenty of statistical evidence that these benefits are catching on big time with consumers, for whom farmers markets and other direct marketing venues such as CSAs are often the gateways to the Good Food movement. There are now more than 8,400 farmers markets across the nation, a number that has more than doubled over the past 10 years and more than quadrupled over the past two decades. USDA last Friday (July 31) released its annual National Farmers Market Managers Survey that showed nearly two-thirds of markets reported increased traffic, and 85 percent of markets are looking to expand their offerings by bringing in additional vendors. Yet if there is one biggest perception problem hindering even faster growth in the sector, it is the belief that some people have that shopping at farmers markets is prohibitively expensive. So here’s the surprise: It’s not! That does not mean that the prices for some items are not going to be higher than at your local big-box supermarket. Organic produce is more labor-intensive to grow than most conventional fruits and vegetables, and can be more expensive than non-organic (though not always). Most vendors at farmers markets are small to medium sized producers, so there aren’t the economies of scale that enable retailers buying from big growers to give rock-bottom discounts. And prices can be high for individual items that are not at the peak of their growing seasons (if they are available at all). 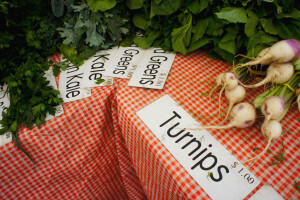 It would be hard to find greens and root vegetables cheaper than the $1 a bunch that Smits Farm of Chicago Heights, Illinois, sells them at Chicago’s Green City Market. • Comparison shopping. Most markets have multiple vendors selling similar varieties, and it may be just coincidence if the first stand you see when you walk into the market is the least expensive. So take some time to stroll around and check out the prices at the different stands. You might find one that is the price leader across the board, or you might find that different stands have lower prices for different items. Besides, part of the reason to go to farmers markets is the fun: The convivial, street fair atmosphere, the friendly vendors, the pleasure of shopping al fresco. What’s the hurry? Green and purple bell peppers were 75 apiece — but 60 cents each for five or more — from Nichols Farm & Orchard of Marengo, Illinois, at the Aug. 1 Green City Market. • Buy in-season. Simple supply and demand: The more of a product a vendor has to sell, the more likely it is that it is going to be priced to move. So practice seasonality and look for your favorite items at the peak of their growing season. 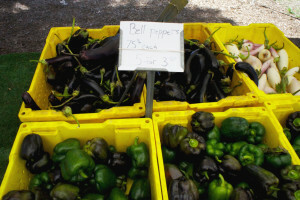 Our area must be having a bumper crop of green peppers based on the prices I saw Saturday at Chicago’s Green City Market. And even though an excessively wet planting season hindered grain growers in our region, I’ve seen sweet corn going for as little as $5 a dozen. 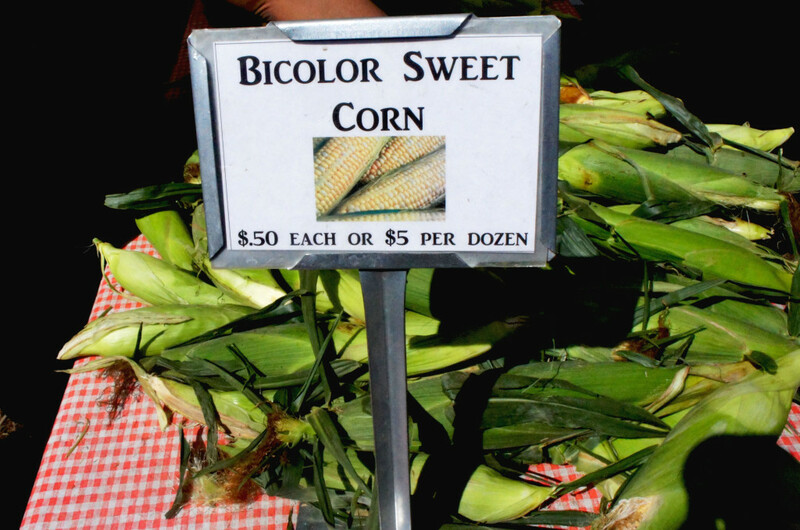 Smits Farm of Chicago Heights, Illinois sold sweet corn for $5 a dozen at Chicago’s Green City Market on Aug. 1. Green Acres Farm of North Judson, Indiana was selling summer squash at 3 for $2 at Chicago’s Green City Market on Aug. 1. • Buy bulk. Many farmers market vendors provide discounts for multiple purchases of the same or similar items. So, for instance, if summer squash is priced at $1 per piece but $2 for 3, it is the equivalent of “buy two, get one free.” You could get a pint of fresh-picked peaches for $4 but a quart (twice as much) for $6. • Buy bulky. Many items for sale at farmers markets are priced per piece. So you can make your dollars go farther if you buy the larger sizes of those items. In most cases, the quality and flavor is going to be the same regardless of size. 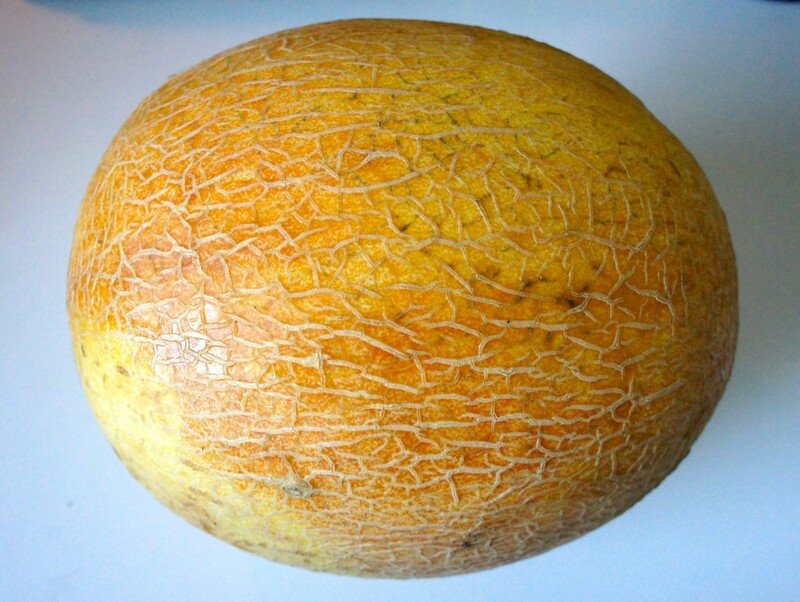 So if a four-pound melon costs the same as a two-pound melon, why not get the bigger one? Your farmers market budget will benefit when you buy larger sizes of set-price items — such as this humongous 6-pound cantaloupe purchased at the peak of the 2014 season. ● The shelf-life advantage. The fresher fruits and vegetables are, the longer they will keep at home. Much of the produce that is sold in supermarkets is grown hundreds or even thousands of miles away, so its shelf-life clock often has been running for a week, sometimes more, by the time you bring it home. Much of the produce you buy at a farmers market is picked within a day’s time, and can be picked at greater ripeness (and flavor) than products that have to travel far and thus are more susceptible to bruising and spoilage. Great taste + longer shelf life + less food waste = a win-win-win situation. • Seconds. The era of mass food retailing got consumers used to the concept of perfect-looking (if not perfect-tasting) produce. As a result, a lot of imperfect fruits and vegetables were just tossed away. The growing national concerns over food waste are leading some consumers to look closely at items — formally known as “seconds” and sometimes referred to as “ugly” fruits and vegetables — that don’t have perfect appearance but are perfectly edible and nutritious and often delicious. These can often be purchased for a lower price. So ask your vendor if he or she has seconds (you’ll probably have to ask, as these items still are rarely put out for display). You may not want to serve them as-is to your dinner guests, but if you are chopping and dicing or making stews or preserves, what difference does appearance make? ● Become a regular. If you become a farmers market regular, you’ll almost certainly get to know your favorite vendors and may quickly get to be on a first-name basis. They will freely share advice about how to prepare the items they sell and what’s in stock, coming up, or at the end of their growing seasons. All reason enough to shop there. But… and I hope I’m not giving away any trade secret here… if you get to know producers and buy regularly from their stands, you are more likely to get a personal discount. That is also true if you introduce your friends and family to become customers. It works in bars and restaurants, so why not at farmers markets? We’d love to hear about great prices you have found at your local farmers markets, or any additional tips you have to share. Please use the comments section below. This entry was posted in Direct Farm Marketing, Family Farms, Farm businesses, Farm to table dining, Farmers markets, Food Entrepreneurs, Good Food marketing, Local Food, Sustainable food retailing and tagged direct food marketing, Family Farms, FamilyFarmed, farmers market, Good Food movement, Green Acres Farm Indiana, Green City Market Chicago, Mick Klug Farm, National Farmers Market Managers Survey, National Farmers Market Week, Nichols Farm & Orchard, Saving money at farmers markets, small farmers, Smits Farm, U.S. Department of Agriculture. Bookmark the permalink.